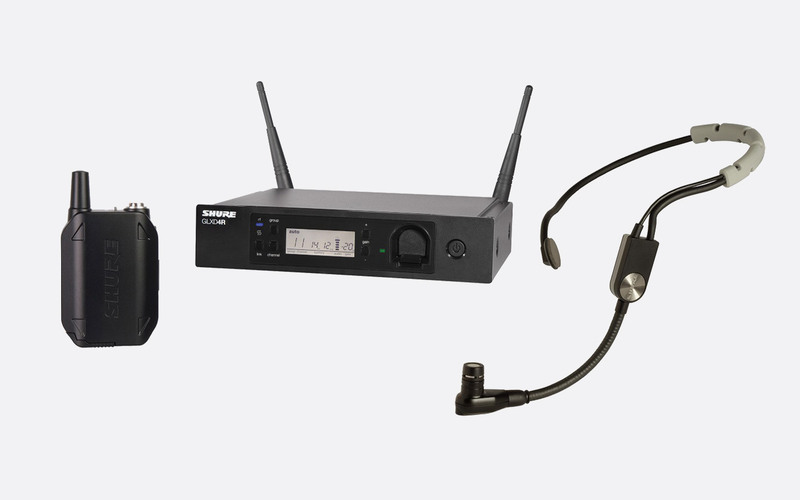 Shure GLX-D Advanced is a range of wireless microphone systems designed for houses of worship, schools, auditoriums and live venue applications, where ease of use and flexibility is desired. These digital systems work on the 2.4GHz frequency band which can be used globally without a license. Up to nine GLXD Advanced systems can be used in conjunction with two UA846Z2/LC Frequency Managers, or up to six systems simultaneously when using a single UA846Z2/LC. 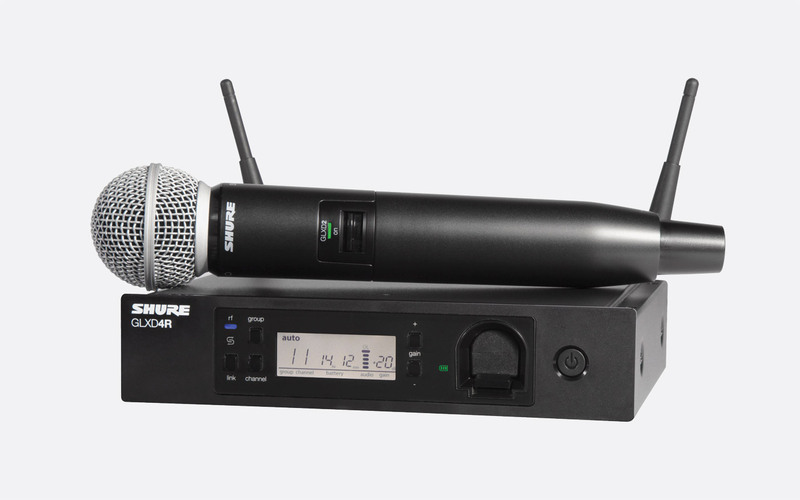 Shure recommend a maximum of four channels in simultaneous use when not used with a UA846Z2/LC Frequency Manager. 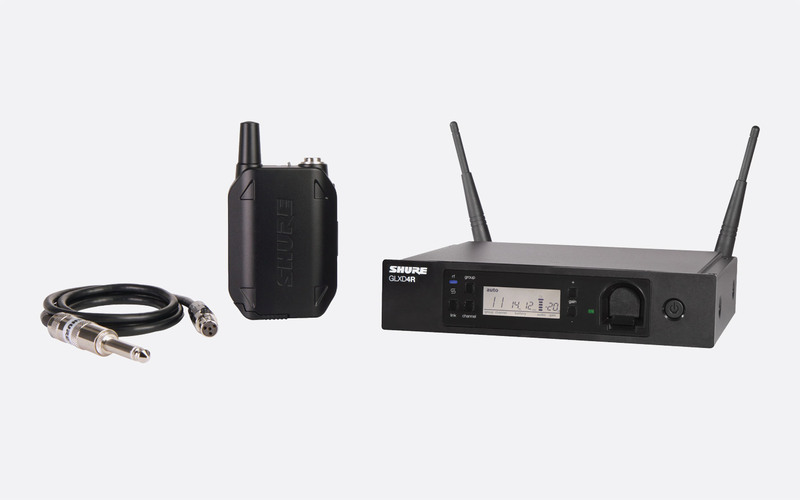 Part of all GLXD systems, the GLXD4R receiver has removable antenna on the rear and can be rack mounted using the included rack-mounting hardware. Up to four receivers can be used simultaneously or up to six systems with a UA846Z2/LC Frequency Manager. 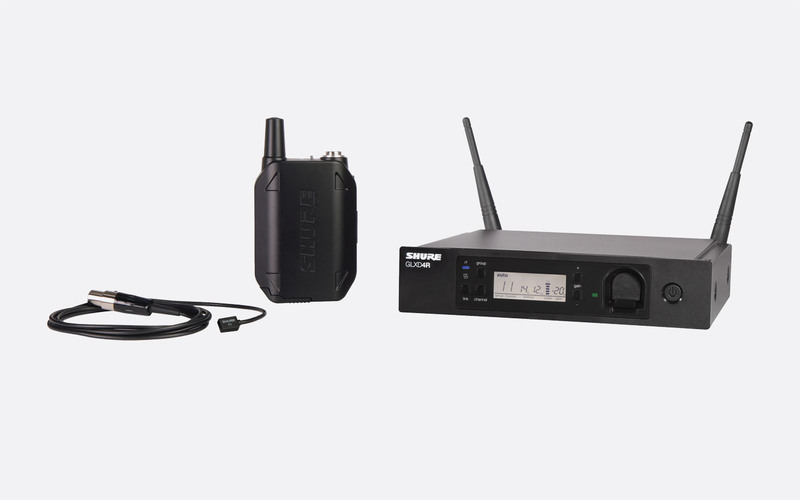 This can be expanded to up to nine GLXD4R receivers when using in conjunction with two Shure UA846Z2/LC units. An integrated 'battery charge port' on the front panel is used allows insertion and charging when power is on, of a Shure SB902 lithium-ion battery. A two-colour LED indicates charging status, with solid green signifying complete charge; flashing green signifying 90% battery charge; and red to show charge in process. In addition to the battery charge port and LED, the front panel has three push buttons; 'Link' for assigning a transmitter, 'Channel' to select the required channel, and 'Group' to select the required group. To the right of these buttons, a large LCD screen displays information such as group, channel, battery life remaining (of assigned transmitter), audio signal, and gain setting, which can be adjusted up and down by using two push buttons to the right of the display. A power button on the right of the receiver, which can be locked by pressing and holding the 'Link' button whilst initiating power, completes the functionality of the front panel. All other receiver controls can be locked by pressing and holding the 'Group' and 'Channel' buttons simultaneously. The rear of the receiver has antenna A and B inputs for included antennae, a 15V 600mA power supply input for the included PSU, and a USB port for firmware updates. A 6.35mm 3-pole jack socket provides an 'impedance balanced' output and 3-pin XLR provides a balanced output, an adjacent switch sets microphone or line level output. Dimensions: 42 x 197 x 163 (h x w x d) mm. Weight: 907.2g. Moulded from ABS plastic, the lightweight GLXD2 handheld transmitter is available as part of the GLX-D Advanced systems or as various separate transmitters with different heads, including SM58 (GLXD2/SM58), SM86 (GLXD2/SM86), BETA58a (GLXD2/B58), and BETA87a (GLXD2/B87A). It can transmit a frequency range of 20Hz to 20kHz, depending on the type of microphone capsule. A single SB902 Lithium-ion battery will give up to sixteen hours of continuous use. A Micro USB port found under the battery casing can be used to implement firmware updates. This Micro USB port can also be used for charging the inserted Lithium-ion battery with the optional USB to Micro USB charger cable. Whilst powered on, an LED positioned above the on/off switch shows the current status of the microphone transmitter. A slow flashing green indicates an attempted re-link with receiver, three green flashes indicate locked transmitter, a constant red shows over an hour of battery life remains, a flashing red shows over 30mins remains and if there is a battery error, an amber LED flashes. Operating range: 30m typical, 60m maximum, indoors without barrier; 20m typical, 50m maximum, outdoor without barrier. Power source: 3.7V rechargeable Lithium-Ion. Battery life: up to 16hours. Dimensions: 252 x 51 (L x Diameter) mm, LXD2/SM58, GLXD2/B58, GLXD2/B87A; 252 x 49mm, GLXD2/SM86. Weight: 267g, GLXD2/SM58; 275g, GLXD2/SM86; 221g, GLXD2/B58; 264g, GLXD2/B87A. 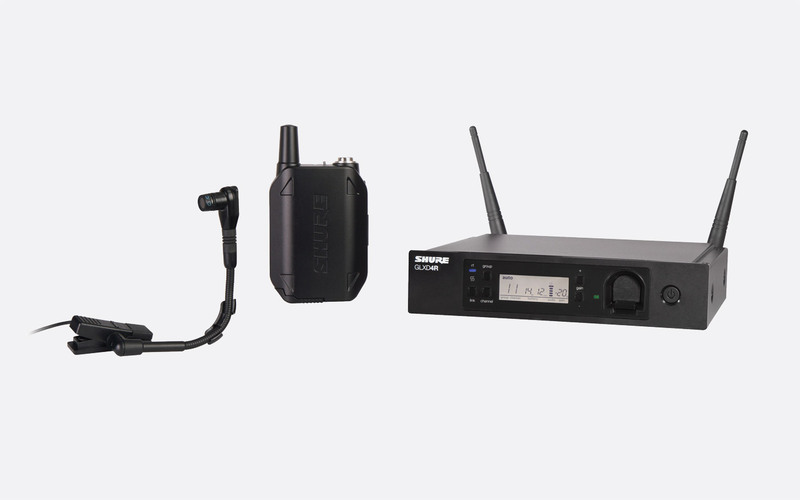 The GLXD1 beltpack transmitter has many of the features offered by the handheld transmitter. 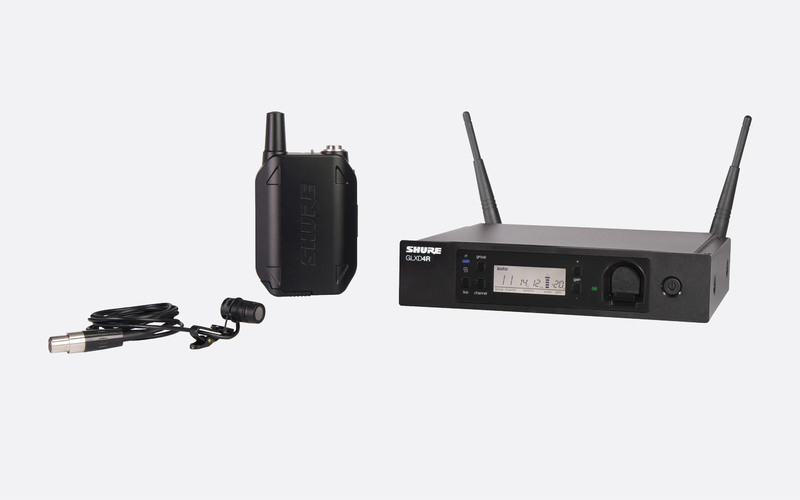 It has a 4-pin male miniature XLR connector (Tiny-QG) for use with optional lavalier and instrument microphones. 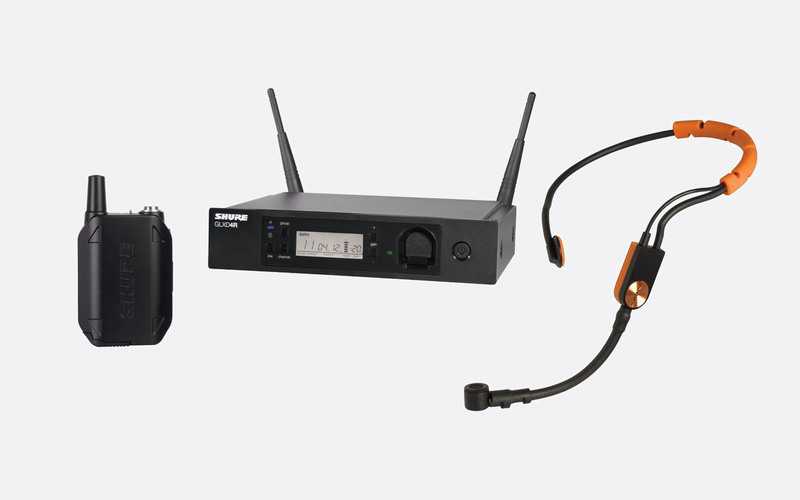 Standard GLX-D Advanced systems including the GLXD1 beltpack transmitter include the GLXD14R/B98H with Beta 98H microphone, the GLXD14R/93 with WL93 omnidirectional lavalier microphone, the GLXD14R/85 with WL185 cardioid lavalier microphone, the GLXD14R/SM31 with SM31FH head worn fitness microphone, the GLXD14R/SM35 with head-worn SM35 microphone, and the GLXD14R/MX53 with MX153 ear worn microphone. A single SB902 Lithium-ion will operate for up to 16hours. Operating range: 30m typical, 60m maximum, indoors without barrier; 20m typical, 50m maximum, outdoor without barrier. Power source: 1x SB902 Lithium-ion battery. Battery life: up to 16h, lithium-ion. Dimensions: 90 x 65 x 23 (h x w x d) mm. Weight: 132g. 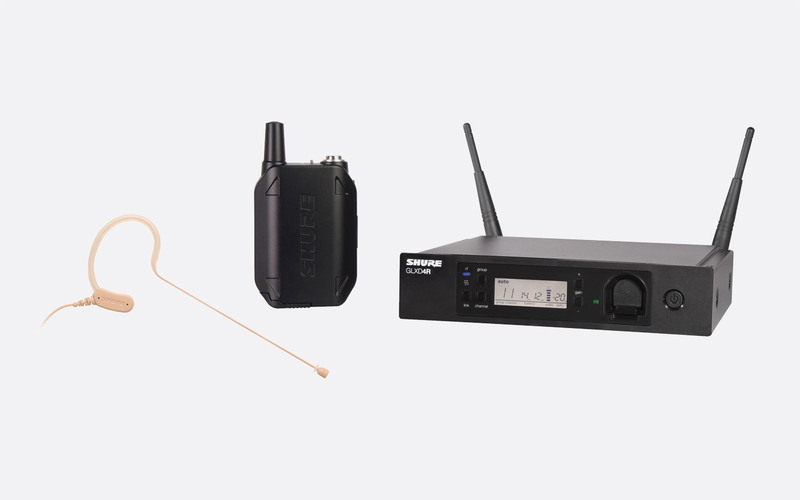 This has been designed specifically for the GLX-D Advanced range of wireless systems. The 1U rack-mounting unit provides 'advanced automatic frequency management' to up to six GLXD4R receivers per unit, or up to nine GLXD4R receivers with two frequency managers linked. Scanning the frequency range for interference, the UA846Z2 automatically allocates and 'seamlessly transitions' to cleaner backup frequencies as required. In most cases this results in a 'one-time setup'. The front panel of the unit has a latching 'rocker' power switch and green LED which illuminates when power is on. There are also two cut-outs in the front panel to front-mount the antennae. The rear panel has a 15V DC power input connector, 6x 15V DC power outputs to link to GLXD4R receivers, and a Micro USB input for firmware updates. There are two groups of connectors, all reverse SMA types, designated A and B. Both have single reverse SMA antenna connector for the 'input', and six RF output connectors to feed to the receivers inputs A and B respectively. The sixth of these outputs from group A and B can be used alternatively as cascade outputs when using a second Frequency Manager. Frequency band: 2400-2483.5MHz. Power requirements: 15V DC. Dimensions: 45 x 483 x 192mm (h x w x d). Weight: 1.63kg. Available in lengths of 60cm, 1.8m, 7.6m, 1.52m, and 3.05m, these coaxial cables are for use with the GLX-D Advanced systems, between remote antennas and a UA846Z2/LC and/or a GLXD4R. Terminations on all cables are reverse SMA type.